Hi OCS readers, we are starting a new topic. It is Lean Manufacturing. We will cover all topics related lean manufacturing through a series of blog posts and we will explain what the Lean actually is. These articles are written by Vijayalaxmi Meharwade and edited by Online Clothing Study. Lean manufacturing is vast subject. As mentioned in the title we will briefly cover related topics. You can gain in-depth knowledge by reading reference materials. Lean manufacturing is good for a company, factory and good for all employees. Many garment manufacturers already followed the path to become a world class manufacturing (WCM) company. Many are aspiring and others are dreaming to have lean manufacturing in their shop floor as well as in office areas. Whatever stage you are at this moment, lean will help you to move to the next step. You are welcome to participate to the discussion on lean topics by posting your comments. On the Day -1, we will discuss - What is Lean manufacturing technology? What is Lean Manufacturing Technology? The retailer’s tagline for retaining customers and improving business is “Buy more for less”. The same holds good for lean manufacturing technology --- that is get more from less --- less time, less space, less human efforts, less machinery, less materials but more customer satisfaction. In other words, lean reduces waste. Lean, a Japanese technology, is an answer to the great challenge of cost reduction in the new economic scenario. Therefore the key lies in reducing the production cost, to increase profits. The following graph shows it all about the profit from two different equations. In the coming days we will publish posts on various lean tools, lean concepts and lean philosophy. Be with us to learn basic knowledge of lean manufacturing. About Vijayalaxmi Meharwade: Vijayalaxmi is a graduate (B.E.) in Textile and Master is Textile Technology (Garment Technology). She has 14 years of experience in research, and working in industry concerning textile and garment manufacturing. She has also worked as a teaching faculty. 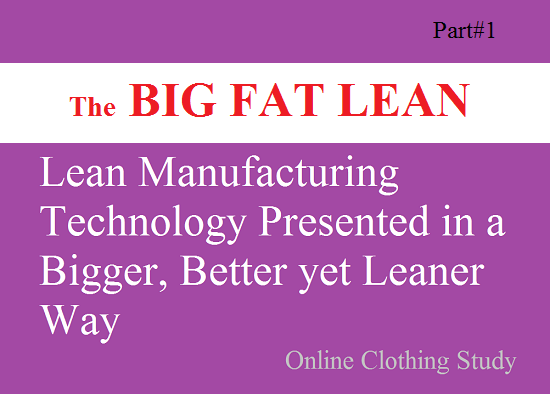 Lean manufacturing in the apparel industry.